Accessories: Accompanied by Vacheron Constantin Extract from the Archives confirming production of the present watch in 1949. Vacheron Constantin production has historically been extremely limited. For example, it is estimated that the yearly overall production for the brand in the 1950s and 60s was about 300 pieces. Such a small output is justified by the extremely high standards of finishing and decorating the company has always abided by: after all, it is considered among the greatest watchmaking brands for a reason. The combination of very high quality and small production means that coming across such remarkable horological gems as the present timepiece in such an honest and well-preserved condition is extremely difficult. 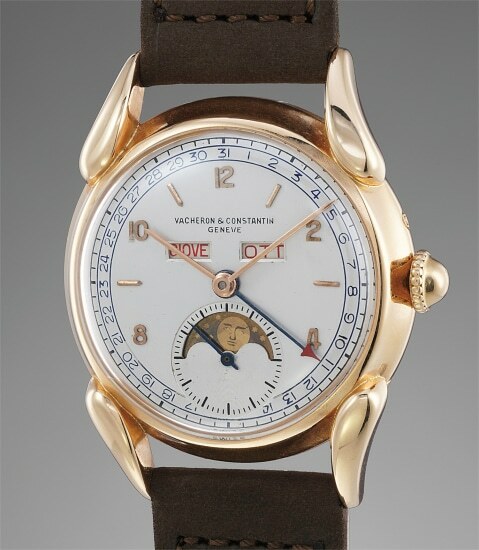 The timepiece represents one of the early calendar wristwatches made by Vacheron Constantin: it is a very classic triple calendar with moonphases, defined by the windows for day and month (in Italian) at 12 o’ clock and an outer track for the date read by a central hand. This layout was typical of the mid-twentieth century and imbues the timepiece with both an outstanding vintage vibe and absolute readability. The model is housed in a pink gold case, a very scarce iteration of an already rare model, and it features one of the most typical Vacheron Constantin design traits: the large sculpted lugs known as “claw” or “Cornes de Vache” (cow’s horns) lugs. Incorporating design elements typical both of the period and also of the brand, offered in extremely honest and well-preserved condition, and of utmost scarcity, the present timepiece is without a doubt an unmissable opportunity for the collector of rare vintage timepieces.